Dr. Saleh is a Radiology Research Fellow, Division of Diagnostic Cardiovascular Imaging, Dr. Nael is a Radiology Resident, Dr. Lohan is a Visiting Assistant Professor of Radiology, and Dr. Finn is a Professor of Radiology and Medicine, the Chief of Diagnostic Cardiovascular Imaging, and the Director of Magnetic Resonance Research, Department of Radiology, David Geffen School of Medicine at UCLA, Los Angeles, CA. Dr. Grover-McKay is a Staff Radiologist and Cardiologist in the Hoag Hospital, Newport Beach, CA. Diagnostic clinical cardiac magnetic resonance imaging (MRI) requires an appropriate combination of temporal and spatial resolution. 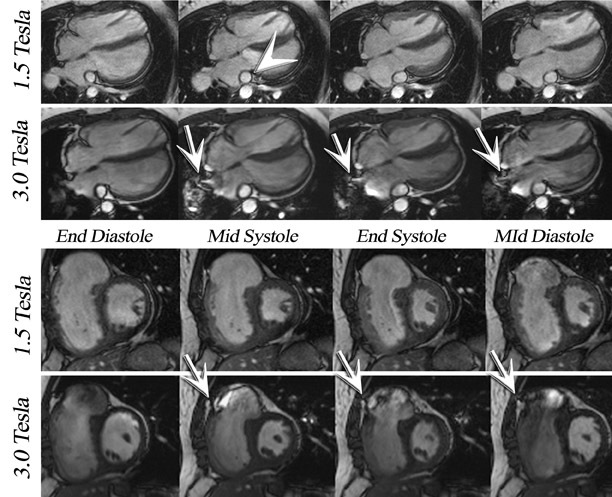 At present, cardiovascular imaging is making considerable advances toward the fulfillment of these requirements, largely because of continued improvements in MRI hardware and software. Optimal diagnostic-quality MRI implies a balance among signal-to-noise ratio (SNR), tissue contrast, acquisition time, and spatial and temporal resolution. Magnetic field strength is one of the major factors affecting image SNR. In 2002, the U.S. Food and Drug Administration (FDA) approval of 3T clinical whole-body scanners opened the way for multiple advanced clinical applications, particularly with regard to MR angiography (MRA). Compared with 1.5T, the higher field strength results in a doubling of SNR due to increased spin polarization. Furthermore, imaging at higher field strengths with gadolinium-based agents can produce further improvements in image contrast. Cardiac imaging at 3T is, however, noticeably different from imaging at 1.5T because of a variety of artifacts that result from susceptibility effects and augmentation of radiofrequency (RF) inhomogeneity. Nael et al 7 showed an increase in main pulmonary arterial SNR at 3T, however, with a reduced pulmonary parenchymal SNR on time-resolved MRA relative to 1.5T. These authors concluded that time-resolved MRA at 3T provides results comparable to 1.5T. However, the relatively lower parenchymal enhancement seen at 3T was thought to reflect greater susceptibility effects at a higher magnetic field because of air-tissue interfaces within the lung. Susceptibility effects increase linearly with field strength and may limit pulmonary perfusion imaging when integrated with inherent SNR drops because of the use of higher acceleration factors. 7 Nonetheless, while it is important to recognize this phenomenon, it is usually not limiting in clinical practice (Figures 1 and 2). With SSFP, blood signal is dependent upon its relaxation time (more specifically upon the ratio of T2*/T1) rather than its speed of flow, so that even with very poor systolic function, blood-myocardial contrast is excellent. 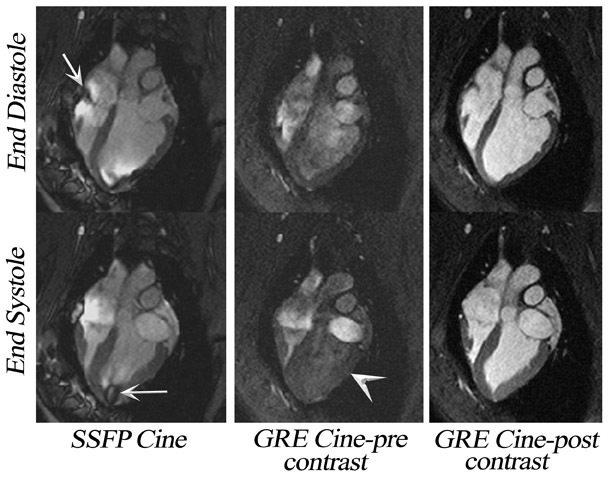 Cine SSFP performs optimally with the shortest possible TR (on the order of ≤3 msec), 13 so imaging speed is almost 3 times greater than that allowed by spoiled GRE cine. 12 Indeed, a high contrast-to-noise ratio (CNR) cine SSFP may be acquired in ≤7 seconds when imaging at 1.5T. Several investigators have confirmed the SNR advantages of cardiac cine at 3T. 14-17 These studies indicate an overall quantitative improvement in SNR for cardiac imaging at 3T. Similar to angiography, the SNR improvements achieved have facilitated the use of parallel imaging with higher acceleration factors and multi-channel RF receiver coils (Figure 5). As a result, the temporal performance of cine SSFP may be further enhanced. 18 However, accelerated acquisition results in the loss of SNR and in the introduction of noise nonuniformly (Figure 5). The main challenges specific to 3T as compared with 1.5T include: B 0 inhomogeneity, increased RF power deposition (which generally limits the flip angle and the minimum achievable TR), longer T1, and shortened T2*, all of which combine to offset the advantages from higher field strengths. While these factors are by no means absent at 1.5T, they are more troublesome at 3T. With regard to SSFP imaging, RF inhomogeneity, which oc-curs because of the shorter wavelength of the RF pulse, makes penetration of deeper structures more difficult (Figure 5, arrows). Furthermore, resonant frequency shifts (off-resonance effects) due to magnetic susceptibility gradients, which oc-cur adjacent to tissue interfaces, manifest as dark bands in the image. Depending on where these dark bands occur, this may be of no clinical significance or may result in severe image artifact (Figures 3, 6, and 7). If an off-resonance band traverses a major inflow vessel (Figure 8, arrowheads) or a cardiac chamber, this may disrupt the steady state and degrade the image contrast. The distance between these bands is inversely related to the TR, thus using the shortest possible TR is desirable. The homogeneity of the main magnetic field is a major determinant in the location of these dark bands on SSFP images. 19 The distance between these bands is indirectly related to the slope of the frequency gradient, with steeper gradients increasing the propensity toward disruption of the steady state. Deshpande et al 20 proposed that a prescan that simulates different imaging frequencies (frequency scout imaging) may be used to visually determine the central frequency. 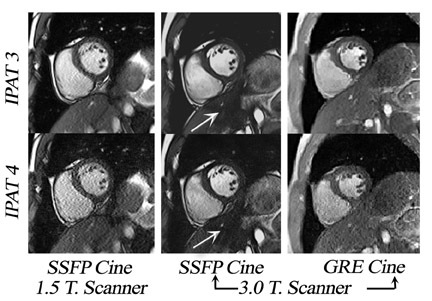 This technique often results in artifact-free SSFP images at 3T but does not necessarily fix all slices for all cardiac phases, as illustrated in Figure 6 and Figure 8. Compared with SSFP, SGE se-quences are less demanding at a higher field. Because of spin saturation, however, SGE cine imaging may yield poor results unless intravascular contrast agents are used 21,22 (Figures 3 and 4). At the time of this writing, however, no in-travascular contrast agents are approved by the FDA for cardiac imaging, and 1.5T has remained the optimal magnetic field for clinical cardiac cine imaging. A high SNR profile is particularly desirable when imaging with PC-cine MRI, because the noise of velocity-encoded images has an inverse relationship to the SNR of magnitude-encoded images. Generally, an increased SNR ratio can be achieved by optimizing sequence parameters such as section thickness, flip angle, echo time, and receiver bandwidth. However, increasing the echo time renders the sequence increasingly vulnerable to motion artifact, and an increase in the section thickness may induce significant partial-volume effects in smaller vessels, such as the coronary arteries or bypass vessels. 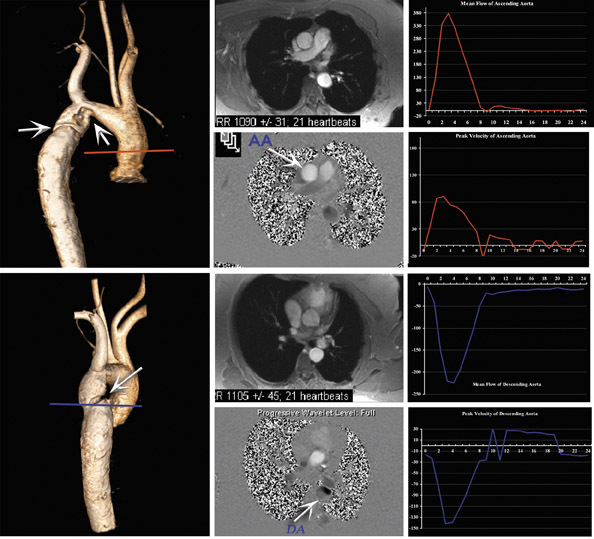 Nael et al 7 and Gutberlet et al 26 studied the PC imaging of the pulmonary artery and aorta (respectively) at 3T, comparing their findings with those at 1.5T. Both authors reported an increase in SNR due to noise reduction at 3T without significant impact upon velocity and flow measurements. Lotz et al, 27 in their in vitro validation study, showed slight overestimation of flow measurement at 3T when compared with phantom pump settings, with an increase in SNR by a factor of 2.5 when compared with 1.5T for magnitude-encoded images. It is assumed that moving to a higher field system will be of interest for small-size vessels, such as cor-onary arteries or bypass arteries, which require higher spatial resolution acquisition in order to reduce the impact of partial-volume effects, and for slow diastolic flow-patterns, which require higher temporal resolution. MRI (as Doppler ultrasound) samples discrete sections of vascular flow and, therefore, it is vulnerable to aliasing if flow velocities are excessively high. Ve-locity sensitivity with MRI may be ad-justed so that such aliasing does not oc- cur. By definition, the velocity-encoding value (VENC) is the velocity, which produces a phase shift of 180°. However, there is also a linear dependency between noise and the velocity encoding, with excessively high VENC levels producing compromises in SNR. 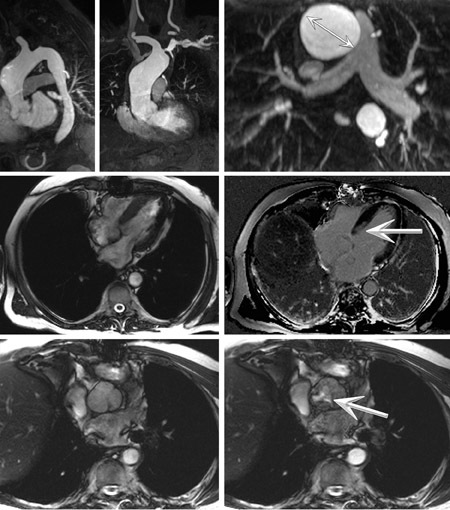 The VENC value can be estimated a priori by using a quick VENC scout imaging sequence for the vessel of interest. Typical VENC values employed for various anatomic sites are provided in Table 1. In the heart and great vessels, flow quantification may be performed in the presence or absence of respiratory suspension. Breath-hold acquisitions are fast and can prevent respiratory motion artifact but are limited with regard to temporal and spatial resolution. Additionally, Sakuma et al 31 studied the effect of different lung-volume respiratory breath-holds on flow measurements and concluded that a small lung-volume breath-hold by shallow inspiration can provide a blood flow quantification that is close to phys-iological blood flow when compared with an acquisition with a large-volume breath-hold. Sugano et al 32 compared 3 different patterns of respiratory suspension: midnormal respiration, inspiratory, and expiratory breath-holding acquisitions for portal-vein flow assessment, concluding that expiratory breath-hold increases blood flow to the greatest degree, with deep inspiratory breath-holding resulting in the least portal-venous flow. Generally, at end-inspiration, venous return can be expected to be in-creased, when compared with cardiac output, with reversal of this relationship at end-expiration. Prolonged breath-holds affect cardiovascular hemodynamics and, thus, may influence flow quantitative measurements. By reducing turbulence, end-expiratory breath-holds may benefit the interrogation of intracardiac shunts and bypass grafts. In current practice, the validity of flow characteristic assessment and quantification has been widely assessed at 1.5T for valvular heart disease, 33-36 congenital heart disease, 37 and disease secondary to pulmonary hypertension. 38-40 Comparable results for 3T MRI are awaited (Figure 9). MRI has been proven to be a reliable means of showing the extent of myocardial infarction at 1.5T. 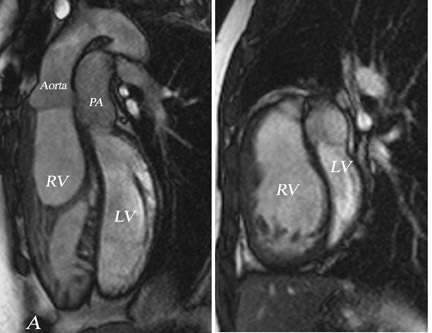 Using myocardial viability imaging, 41 infarcted myocardium exhibits delayed hyperenhancement after contrast injection. The improved spatial resolution of MRI compared with radio-nuclide imaging provides distinct advantages, particularly so for nontransmural infarction, such that MRI is now considered to be a preferred alternative to nuclear tomography where it is available. 42-44 After intravenous injection, contrast material accumulates within non- viable myocardium within minutes of administration, with relatively slow wash-out. As described by Simonetti et al, 45 the conspicuity of such enhancement may be increased by using an appropriate T1-weighted imaging technique, such as segmented-k-space inversion recovery (IR) GRE (Figure 10). More recently, variants of SSFP have been successfully used in the assessment of myocardial hyper-enhancement imaging for viability at 1.5T. Inversion recovery SSFP can be run as a single-shot technique within a single heartbeat. When used in this way, the bandwidth for SSFP is several-fold wider than that used for GRE, allowing the acquisition of more lines of data within the same time, and resulting in significantly faster imaging. This technique may be of value in patients in whom breath-holding techniques are inappropriate or in those with cardiac arrhythmia. However, the use of this rapid-imaging technique incurs a penalty in the form of limited spatial resolution, with a reduction in T1 contrast effects. Huber et al 47 compared segmented IR GRE at 1.5T with PS IR SSFP at both 1.5T and 3T for 10 patients, using a double dose of a gadolinium contrast agent (0.2 mmol/kg). An IR SSFP technique allows for multislice imaging during a single breath-hold without adapting the inversion time, at a cost of lower CNR when compared with single-slice segmented IR GRE at 1.5T. However, CNR was higher (with magnitude imaging) at 3T. Huber et al 47 showed a very slight overestimation of the infarct volume using PS IR SSFP at both 1.5 and 3T, a finding previously described during other comparative studies. 48,49 This observation has been related to the inherent contrast characteristics of the SSFP sequence, which is dependent on the ratio of T1/T2 and the presence of edema around the infarcted area. Left ventricle inflow-outflow tract cine imaging. If the patient also requires chest MRA, viability imaging may be performed 10 minutes after chest angiography, obviating the requirement for a separate contrast medium injection of 0.1 mmol/kg of gadolinium. In our experience and in that of others, 50 however, the use of an appropriate imaging technique is more important than the timing of image acquisition after gadolinium administration. Viability imaging (segmented IR GRE) is usually run as a breath-hold technique where 1 slice is acquired in approximately 12 seconds, and the whole heart is covered in 10 to 12 slices. In this implementation, it is necessary to set the acquisition window during mid-diastole (to eliminate blurring from cardiac motion), with the acquisition time for a single slice (be-tween 8 to 10 seconds) determined by the patient's heart rate and magnetization re-laxation of normal myocardium (usually approximately 2 heart beats). Finally, to minimize partial-volume effects, one can balance between SNR and spatial resolution. Myocardial perfusion deficits may not be apparent in studies performed at rest. However, stress-induced increases in myocardium contractility (to roughly 3 to 4 times higher) 51 and coronary vasodilatation enhance the flow rate in normal coronary vessels, but not in those with flow-limiting stenosis. Several clinical reports have endorsed the accuracy of dynamic myocardial perfusion imaging at 1.5T in combination with adenosine or di-pyridamole. 52-61 Ingkanisorn et al 62 ex-amined and followed-up 135 patients for CAD risk factors, who presented to the emergency room with chest pain, but had a negative ECG, normal troponin level, and normal average ejection fraction. In their experience, stress perfusion MR, with 100% sensitivity and 93% specificity, was superior to total cardiac risk factors >3 (sensitivity of 65% and a specificity of 76%) as a predictor of ad-verse outcome. For MRI evaluation of perfusion deficit, one would want to use T1-weighted imaging (gradient-echo, echoplanar imaging, or SSFP) with the use of at least one of the magnetization preparation schemes (inversion or saturation recovery pulse). Temporal resolution of every or every other heart beat. In-plane spatial resolution better than 3 mm, to enable subendocardial assessment, through the whole heart by means of acquiring a minimum of 4 slices (3 short-axis-apex, mid, and basal-and one 4-chamber view). No caffeine or theophylline intake within 24 hours of scan. Two IV lines are needed to infuse the contrast and adenosine separately. To monitor any possible side effects of adenosine infusion, the patient is out of the magnet during the first 2 minutes of infusion and then placed back into the bore, and contrast is infused, preferably, after 3 minutes of adenosine infusion. Acquisitions are breath-hold; however, if too long (usually 45 to 60 seconds), patients are told to take shallow breaths during imaging. Studies at 3T are not different for adenosine; however, there must be some optimization for pulse sequence properties. Some data regarding 3T myocardial perfusion imaging are currently available, evaluating perfusion imaging at 3T compared with 1.5T and showing higher SNR and CNR and higher peak enhancement at 3T. 14,15,63 However, B 1 inhomogeneity is higher at 3T and may com- promise suppression of background tissues. In addition, higher T2* effects may require a reduction of gadolinium dose. Because of these issues, pulse sequences and protocols utilized at 1.5T need modification to provide diagnostic images at 3T. For example, to reduce the effects of field inhomogeneity, shim gradients may be helpful. During first-pass perfusion studies, a dark rim in the left ventricular subendocardium is sometimes seen. This artifact has been attributed to susceptibility artifacts because of the bolus of contrast, motion, spatial resolution, or a combination of these factors. 64 Di Bella et al 65 showed in ex vivo hearts, studied at 3T using GRE sequence that by increasing the spatial resolution of both data acquisitions, the size and intensity of the artifact decreased. In practical terms, this artifact could mimic ischemia where none was present. For the same reason, it is recommended that perfusion images be assessed in conjunction with corresponding cardiac cine and delayed enhancement images. Therefore, a complete clinical perfusion assessment is recommended to be ac-quired at 1.5T. Quantitative myocardial perfusion using arterial input function (AIF), which is the concentration of contrast in the left ventricle as a function of time during its first pass, has not been adequately re-solved to date, because a high gadolinium dose is required for high T1 sensitivity and high myocardial SNR. However, a high gadolinium concentration causes a nonlinear relationship between signal intensity and contrast agent concentration, and leads to underestimation of the AIF. 66 Kim et al 67 used a hybrid echoplanar imag-ing pulse sequence at 3T that was modified to acquire data for a less distorted and higher calculated AIF and the myocardium by using 2 different saturation-recovery time delays. However, more studies are needed to evaluate the clinical effect of these findings. One preferred current MRI method for imaging the coronary arteries at 1.5T uses noncontrast 3D SSFP imaging. 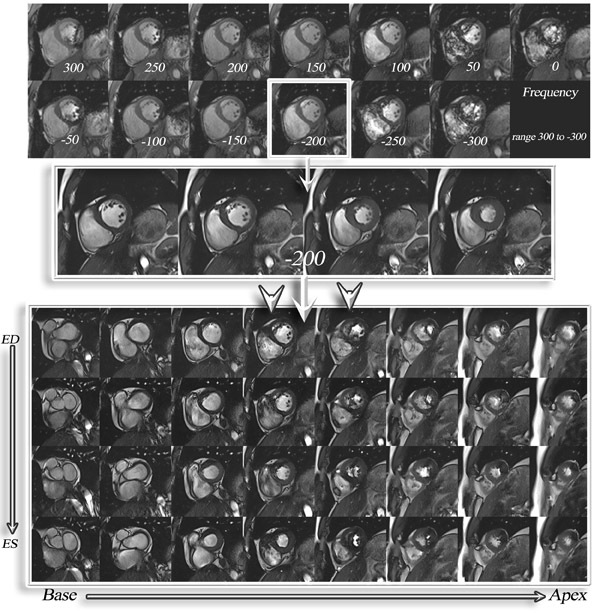 69 Steady-state free-preces-sion imaging holds a number of advantages relative to SGE when imaging at 1.5T; however, for the same reasons discussed above, gradient-echo sequences are more desirable when imaging coronary angiography at 3T, 70 particularly contrast-enhanced 3D SGE (Figure 11). Longer myocardial T1 values at 3T warrant a longer IR time for myocardium suppression, when compared with those used at 1.5T. However, the arterial half-life of extravascular contrast agents is very short, resulting in a compromise in the spatial resolution achievable during a single breath-hold acquisition, with the data being acquired during the mid-diastolic phase in order to minimize cardiac motion-related artifacts. Bi et al 71 have shown the feasibility of using a cardiac motion-resolved 3D coronary MRA technique at 3T, using an ex-travascular agent, in a single breath-hold. Currently, routine cardiac imaging at 1.5T has been proven as highly accurate in the evaluation of myocardial function, perfusion, and viability (Figure 12). However, functional imaging at 3T using SSFP cine imaging may be quite time-consuming because of the necessity for sequence fine-tuning to avoid artifacts. There is little doubt, however, that ongoing developments in machine hardware, pulse sequence design, and image reconstruction methods will address these shortcomings in future times. 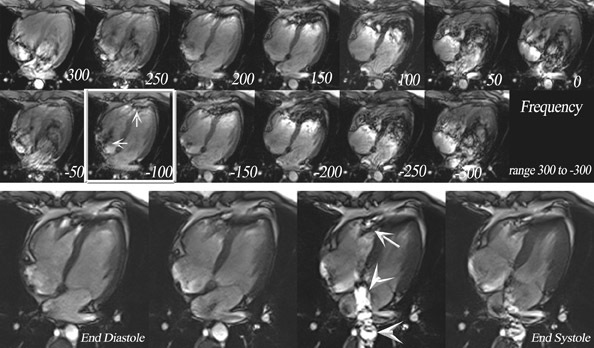 Cardiovascular MRI at 3T. Appl Radiol.